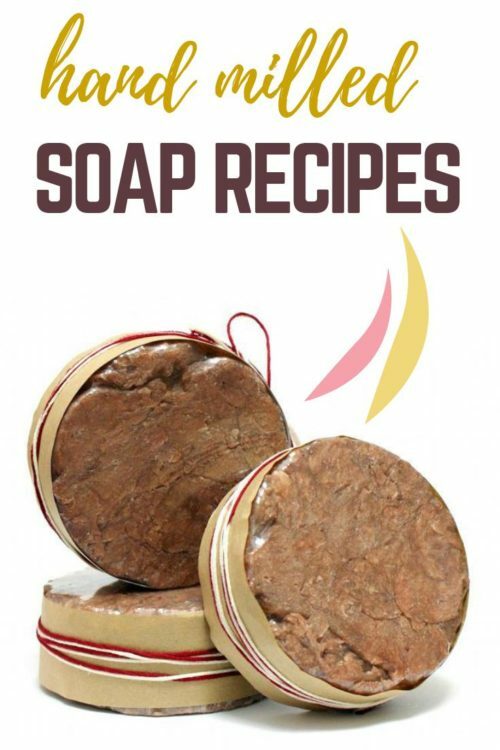 130+ homemade soap recipes to make for every skill level. Learn how to make a variety of homemade soaps for three different types of soap making – cold process soapmaking, melt and pour soapmaking and hand milled soapmaking. 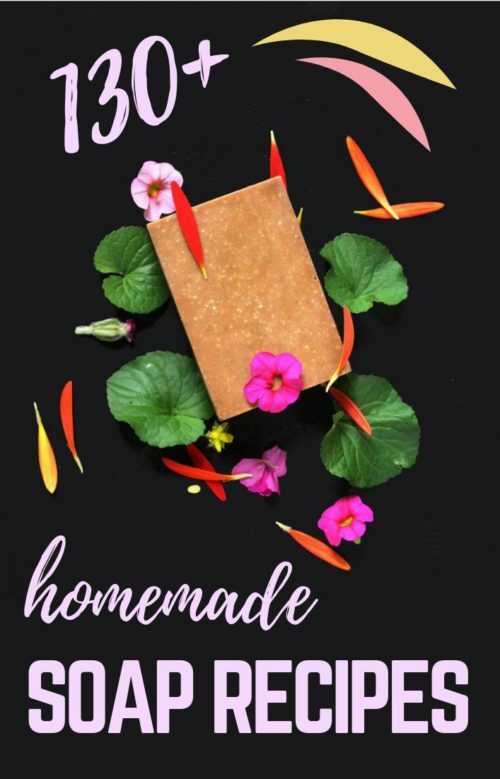 This huge collection of homemade soap recipes can be made to naturally care for your family’s skin or to gift to friends. Many of these recipe you can also make to sell at your local farmers market, craft fairs or online on sites like Etsy. Following you’ll find collections of my favorite homemade soap recipes ever made. 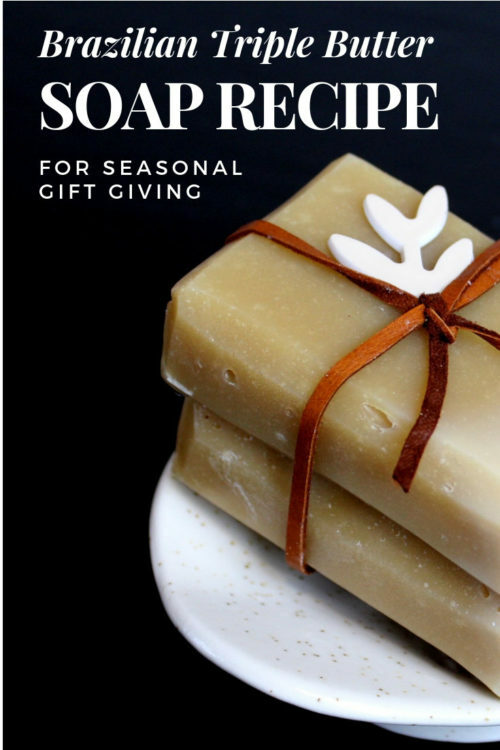 Whether you want to make melt and pour soap, cold process soap or even hand milled soap, these homemade soap recipes make beautiful gifts as well as everyday skin care products for you and your family. 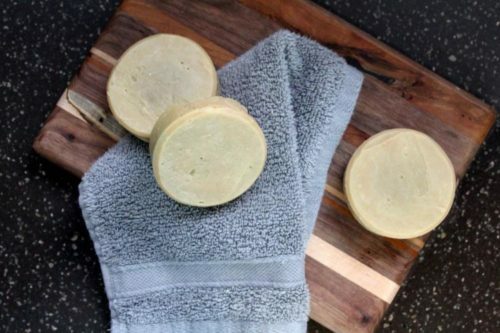 I supply a basic overview of the cold process soapmaking method, along with homemade soap recipes suitable for beginners, here. 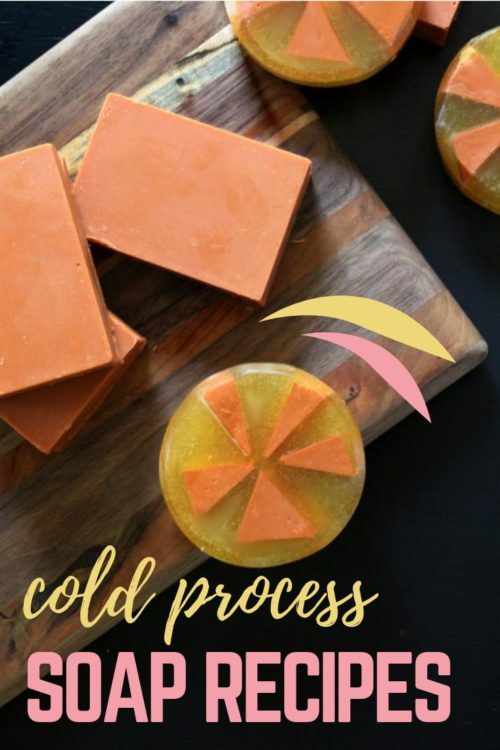 You can also learn how to customize your own cold process homemade soap recipes via my easy to understand tutorial here. Now that you’ve made one or more of my favorite homemade soap recipes, it’s time package and label them for sale or to give as handmade gifts! 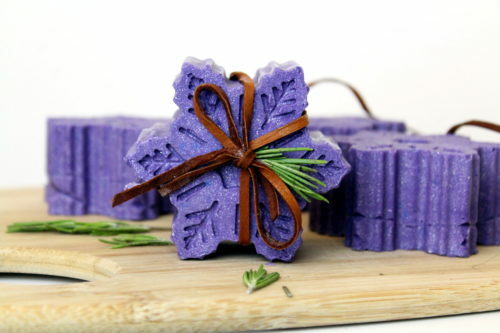 You can find some amazing DIY ideas for packaging your homemade soaps here. 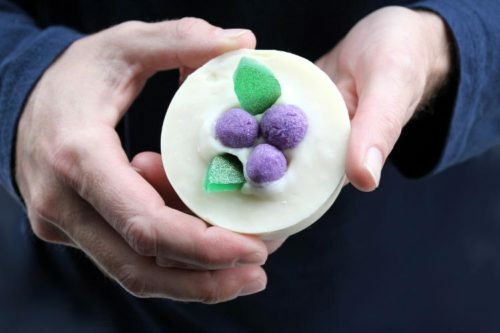 (There are even creative ideas for tackling the packaging for round soaps.) 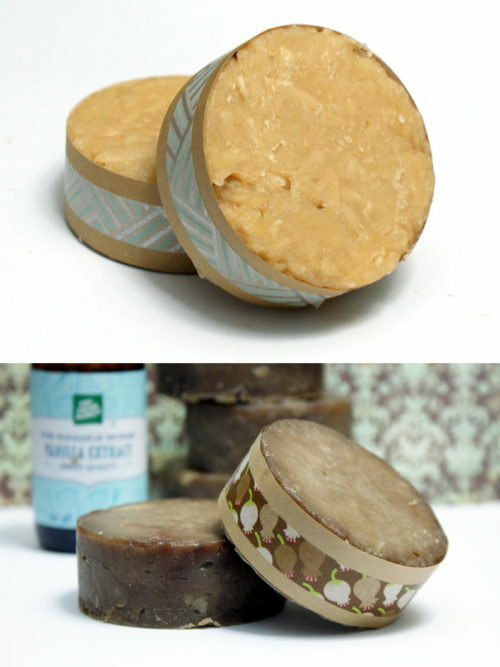 You can also learn how to create custom soap labels with this tutorial. 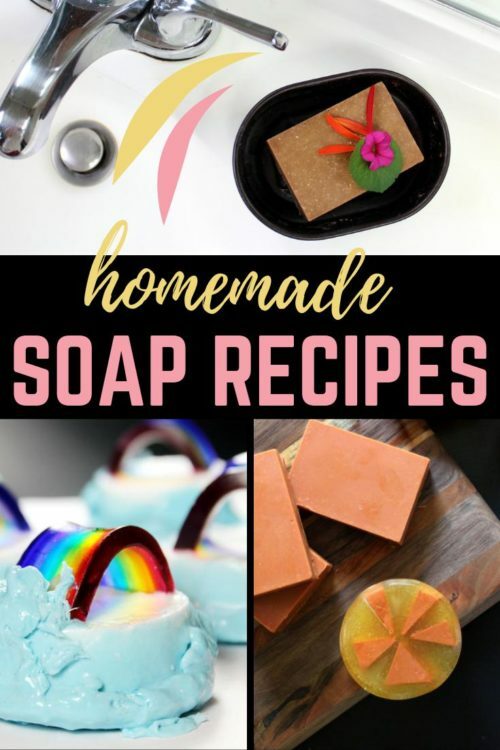 Discover more homemade soap recipes along with ideas for DIY bath and beauty products by following me on Pinterest. You can also find me on Blog Lovin‘, facebook, twitter and instagram. 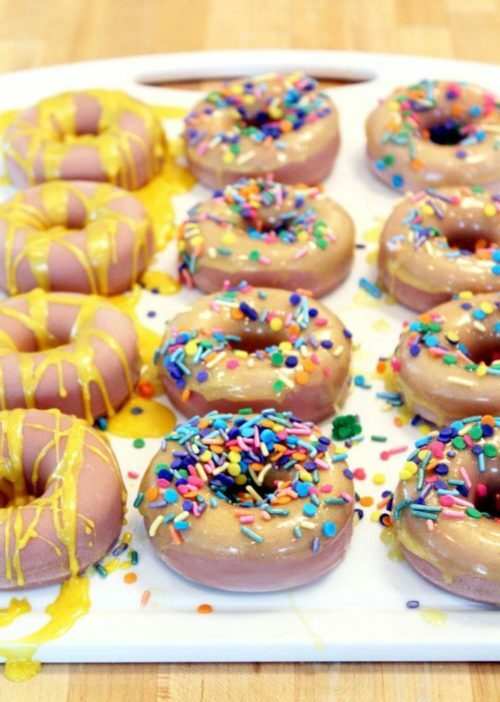 Or sign up for my semi-weekly newsletter to stay updated on new recipes. 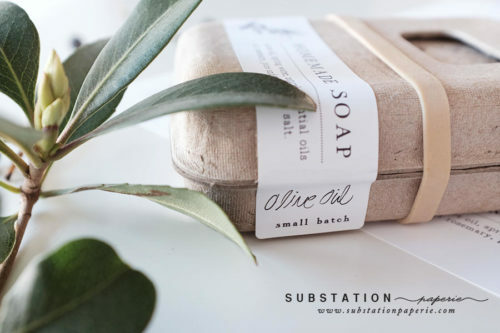 If you’re looking for creative ways to package soap for sale to set your product apart at craft fairs and events, then you’ll love these easy soap packaging and labeling ideas! 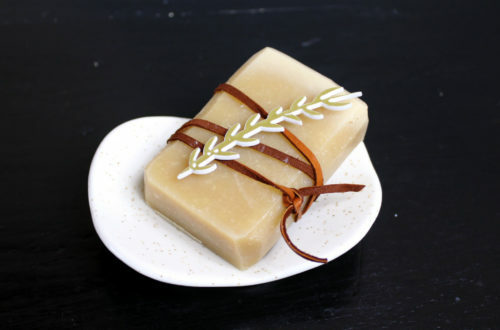 Keep reading to learn the best ways to package homemade soap for sale and put your soaps a head above the competition. 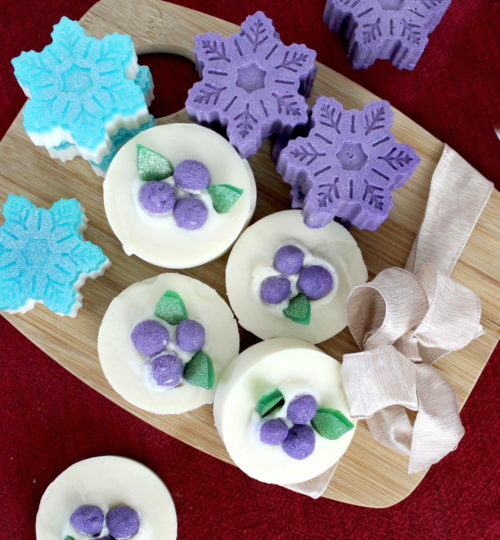 Plus learn how to make some of my favorite homemade soap recipes for winter skin care. I used scrapbook supplies and bakers twine to decorate these homemade soap bars. Simply print out your ingredient list and other information onto squares of cardstock. Then use bakers twine or a decorative ribbon to attach the ingredient list to the bottom or back of your soap bars. Simply slip the ingredient list under the bakers twine to safely secure it to your soap. 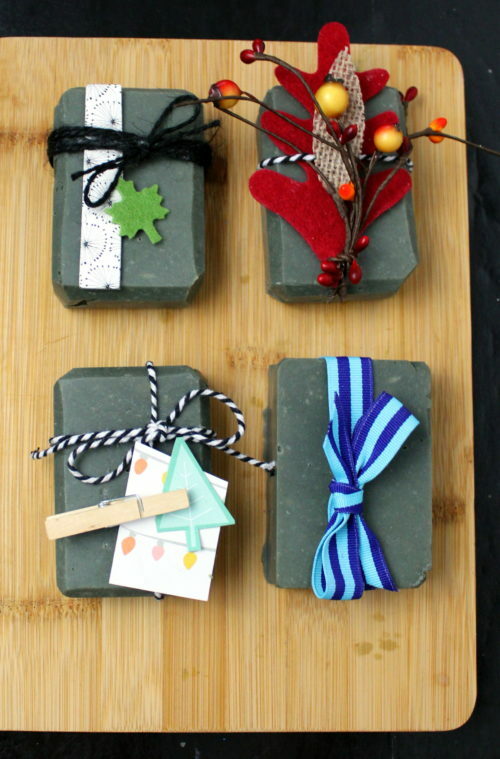 This is also a great way to package soap for seasonal handmade holiday gifts. It’s really as simple as wrapping chipboard elements, cardstock cutouts and felt shapes onto your soaps using ribbon, string or twine. 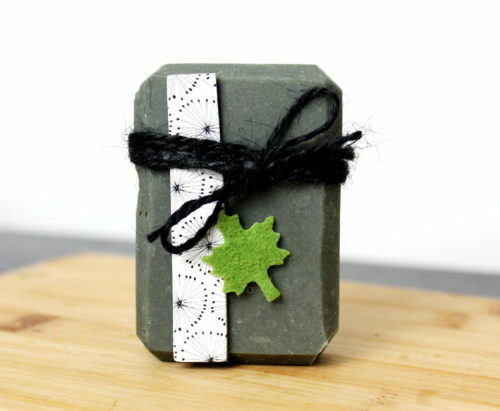 You can also use patterned scrapbook papers to wrap your soaps like little presents. A custom cigar band then displays your information or message. 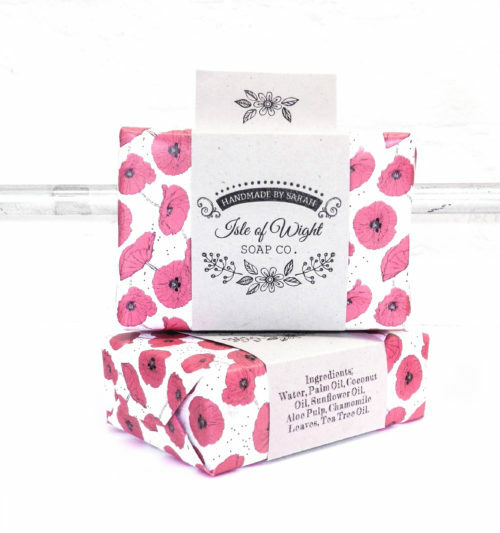 I love this custom cigar band and patterned poppy paper combo from The Creative Artisan Co. You can order these personalized soap labels as a set or separately with your own custom business logo or message for handmade soap wedding favors. 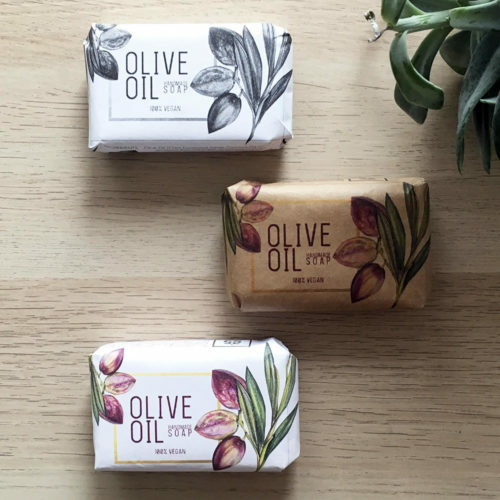 Or consider all-in-one custom soap packaging like this custom soap packaging design from Andrea Tips that wraps and labels your soap all at one with just one product. 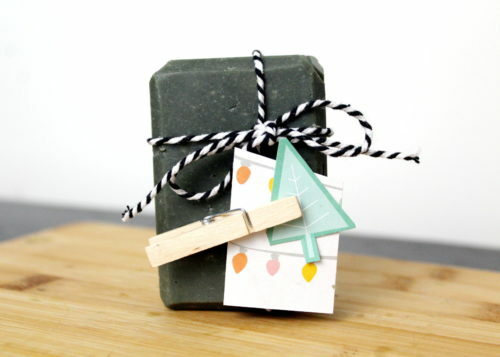 There’s even a soap wrapping tool that allows you to hand wrap your homemade soaps perfectly every single time! 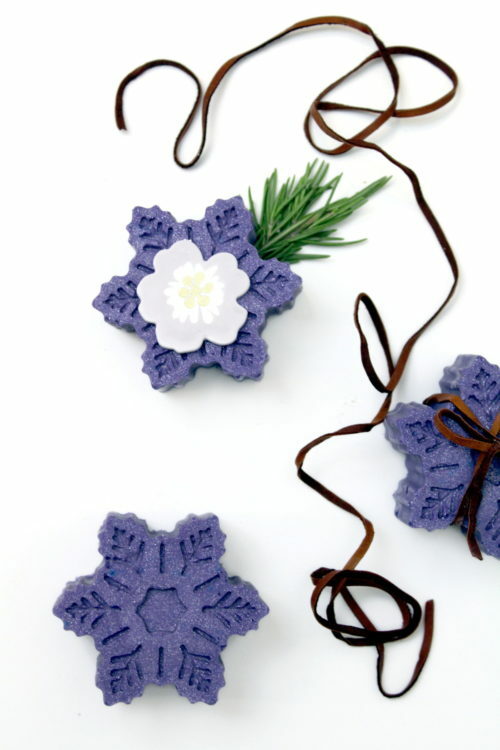 I also love this simple idea for tying leather cording around shaped soaps and accenting with herbs like rosemary. It’s a really easy way to add that extra touch to your handmade holiday gifts. 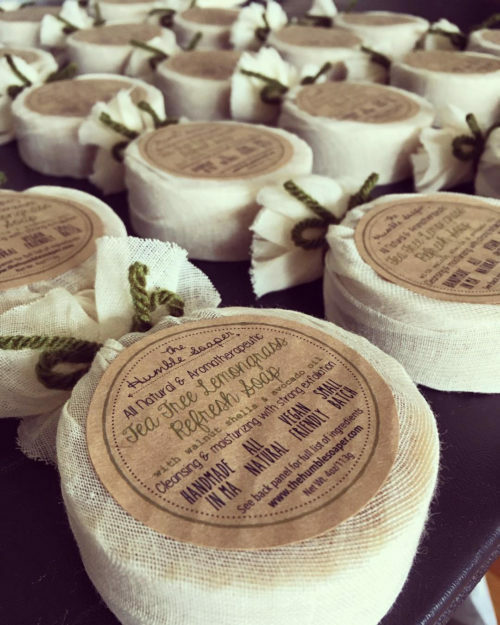 If you’re looking for ways to package your soaps to sell you can also put your label around the diameter of your soap in lieu of the washi tape. 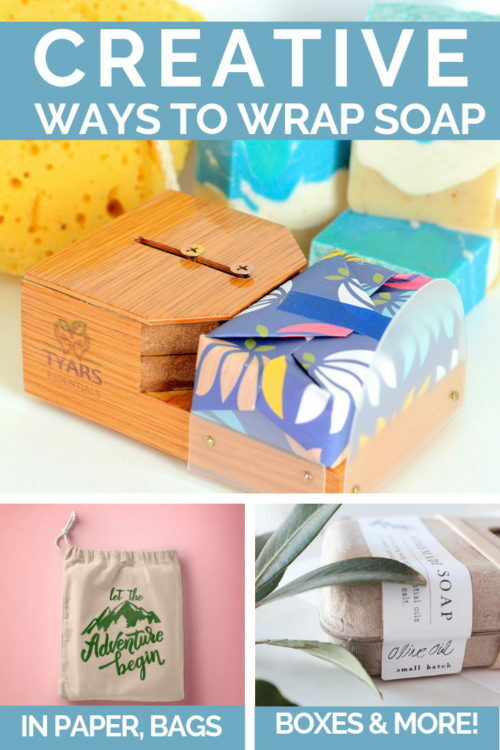 Or try one of the following ways to package round soap. I love how attractive the soap label is on these ways to package soap from Etsy sellers. 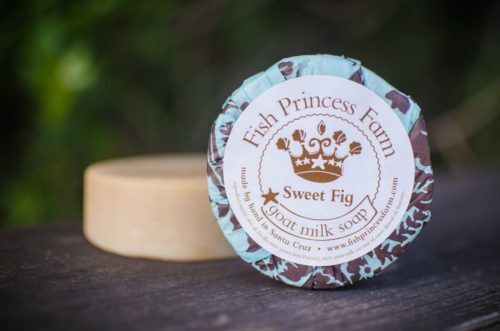 This sweet fig goat milk soap from Fish Princess Farm illustrates one of the more common ways to package soap using patterned paper or fabric and a round sticker label. 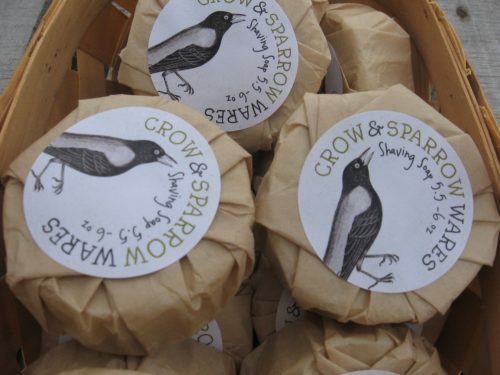 You can also use plain colored tissue paper similar to this soap example of a bar of homemade shaving soap from Crow Sparrow Wares. 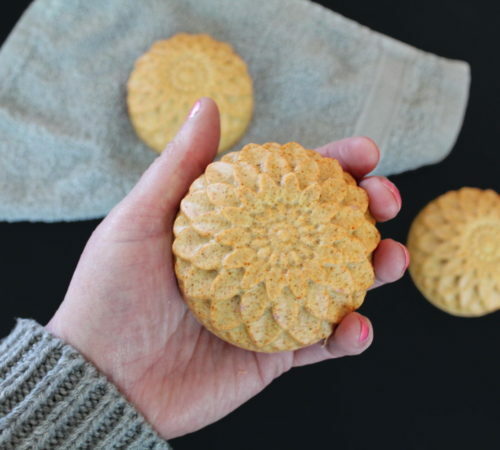 To give your homemade soaps as handmade holiday gifts, you may want to use a simple, round handmade with love sticker for your round soap bars. I also love this twist on using paper as one of the ways to package soap. Instead, The Humble Soaper uses breathable, gauze-like fabric as a unique way to wrap her homemade soaps. 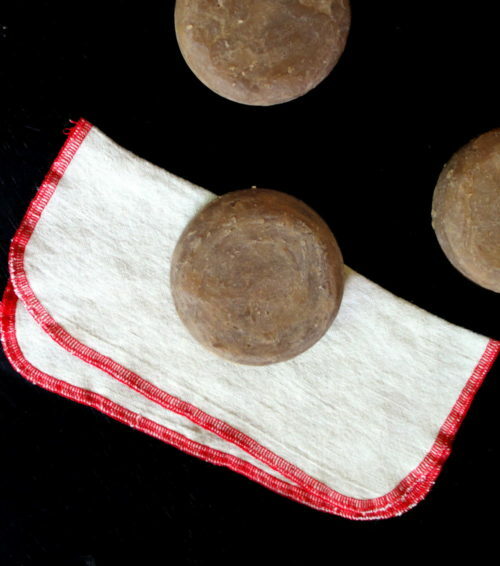 Rather than folding the fabric into the center of the soap bar, she instead ties the fabric on top as illustrated by this example of her natural round soap bars. 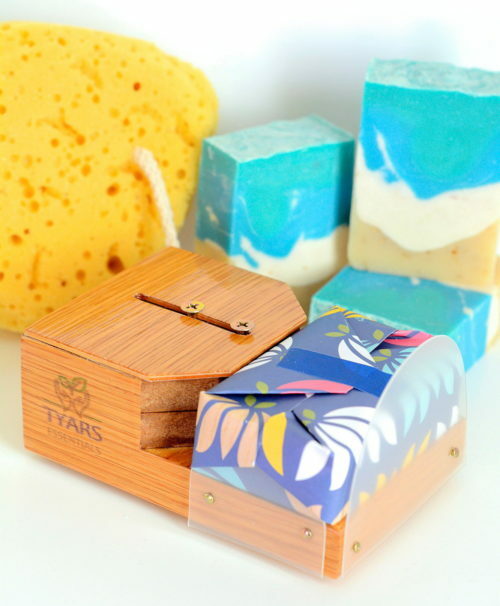 Eco-friendly carton soap boxes will make your green friendly soapmaking business shine. The carton soap boxes from GREENKraft come in three sizes, are made with recyclable cardboard and are 100% recyclable. They also feature a nifty little window so you can show off your homemade soaps inside. I think they look especially nice with these custom apothecary labels from Substation Paperie. Gable boxes and pillow boxes, like these from Cookiebox Store, are another wonderful way to package your homemade soaps for handmade holiday gifts. Or give these clear boxes a try. 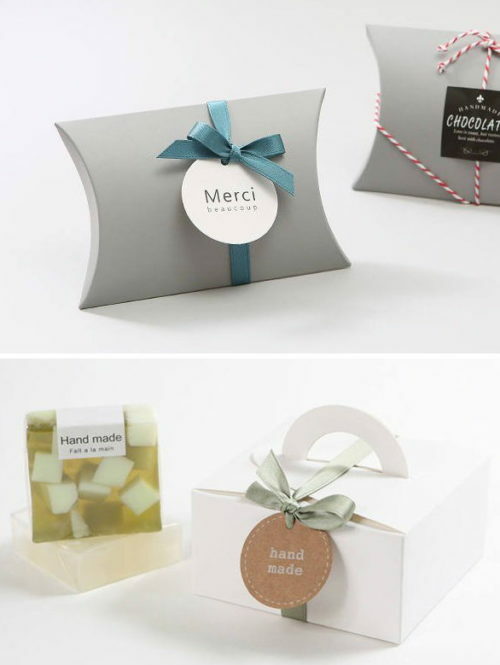 These clear soap boxes make stylish packaging for melt and pour macaron shaped soaps and are perfect for homemade soap wedding favors. Bags are also one of the easiest ways to wrap soap for sale or to give as handmade holiday gifts. 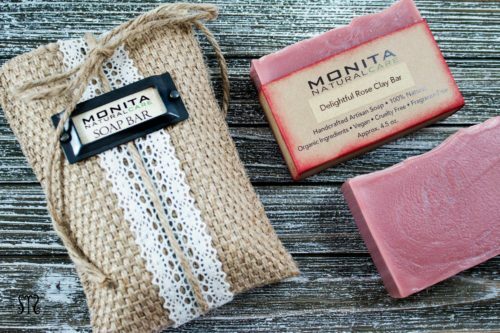 Monita Natural Care sells decorative burlap bags for her homemade soaps that you can for gift giving. However, it’s also great inspiration for designing your own burlap bags for handmade holiday soap gifts. 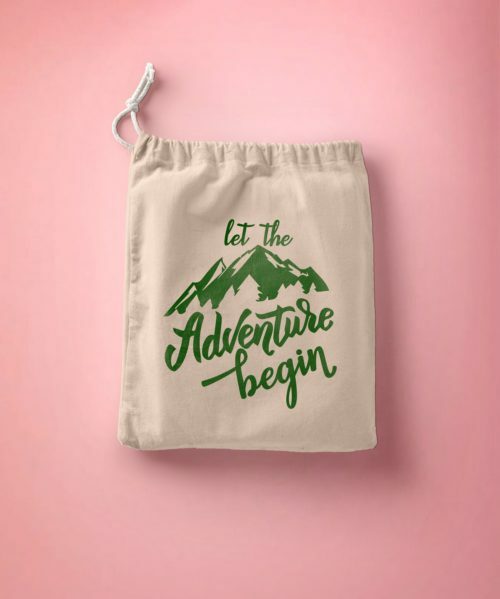 These cotton muslin printed bags from USCreativeshop are available in bulk for employee gifts, wedding favors or soaps for sale. They come in a variety of size options to best fit your needs. I also love that these bags can be reused time and again. For more ways to package soap for sale or to give as handmade holiday gifts, be sure to check out more soap packaging and labeling ideas on Etsy here. You can also shop for homemade soaps from my curated collection. Alternately, keep reading for some of my all time favorite homemade soap recipes for winter skin care. If you suffer from dry skin or eczema in the winter, or other times of the year, it may be time to switch up your natural skin care routine. These homemade soap recipes are perfect for winter skin care. Made with natural skin conditioning ingredients, all of these winter homemade soap recipes nourish skin without stripping it. You’ll love the difference a moisturizing, low cleansing soap can make for your skin! 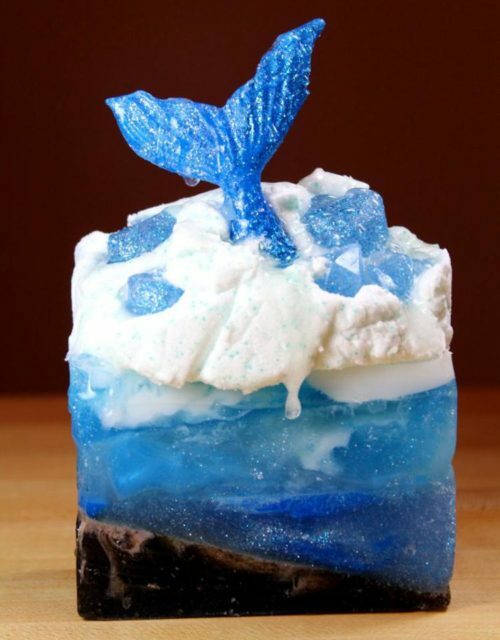 Have photos of your homemade soaps or great soap packaging ideas? Then be sure to tag your pictures with #soapdelishowoff when you share ways to package soap on instagram. For homemade soap recipes, you can follow me on your favorite social media platforms. You can follow me on G+, Pinterest, Facebook, Twitter, Blog Lovin’ and Instagram. Alternately, you can also subscribe to Soap Deli News via email for future updates, DIY projects and recipes. This post is sponsored by Soap Bar Lounge. All opinions are my own. 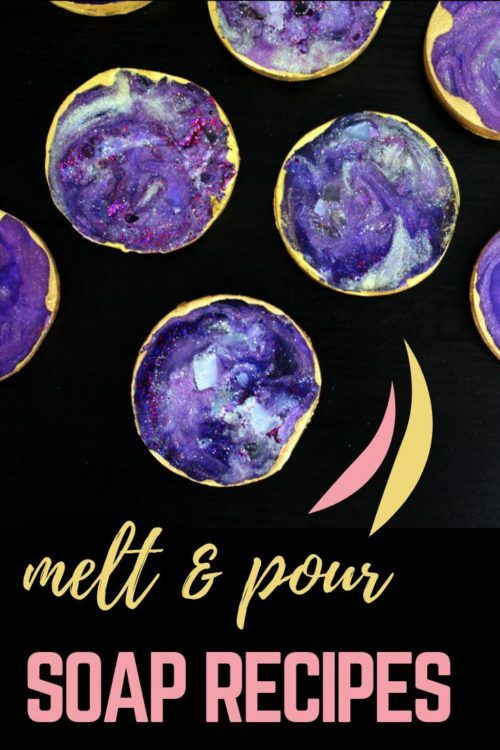 Create the perfect pairing for seasonal gift giving by combining a bar of homemade soap with a soap dish from Soap Bar Lounge! 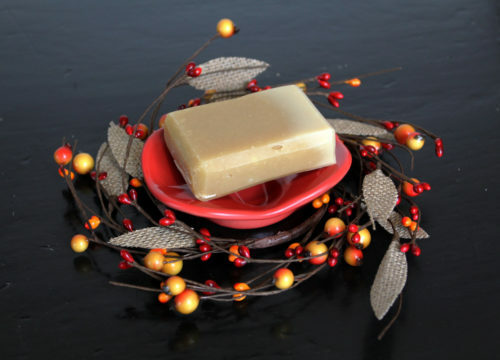 Keep reading to learn how to craft your own skin conditioning triple butter soap recipe. Plus discover what makes Soap Bar Lounge ceramic soap dishes the best option for your homemade soaps! Regardless of the season, if you have dry skin, then you probably avoid using products that irritate your condition. For me, that means using a homemade soap bar in the shower. I also keep homemade soaps by the sink, one in the kitchen and one in the bathroom, where they get used most often. Not only is washing my hands important for sanitary reasons (no one wants to accidentally ingest salmonella) but it can also prevent the spread of cold and flu germs. Of course, washing your hands on a regular basis can leave them feeling tight and dry – especially as cold weather hits. So I formulated a Brazilian triple butter soap recipe to counteract the drying effects of hand washing. It’s also great as we move into the cold, dry air that’s common throughout fall and winter. 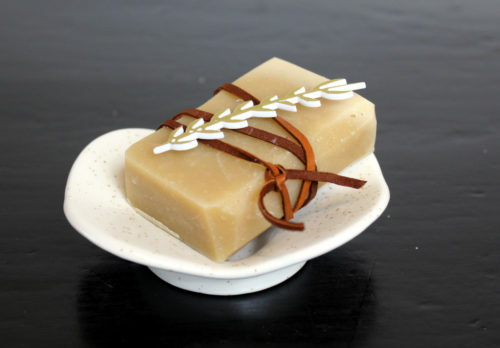 To help my homemade soap bars last longer, I’ve started using soap dishes from Soap Bar Lounge. As you may know, when homemade soaps sit in a pool of water, or are unable to dry out between uses, they can become soft and mushy. When this happens, soap starts to disappear a lot faster with each use. The soap dishes from Soap Bar Lounge, however, prevent this from happening. 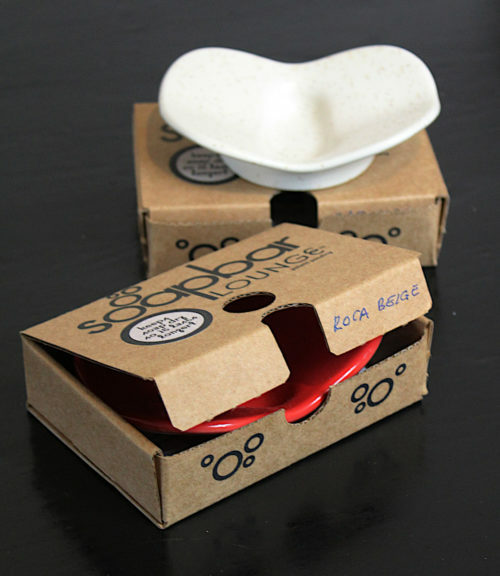 Their patented soap dish design allows for air flow around your homemade soaps as well as a way for your soap to drain. Even better, because there are no holes in the bottom of these dishes, you don’t have to worry about water draining onto your clean countertop. As a result, your soaps not only last longer, your countertop stays clean! I really love that Soap Bar Lounge soap dishes are made right here in the USA using high quality, glazed ceramic. This means they not only look great, but they’re also easy to clean. 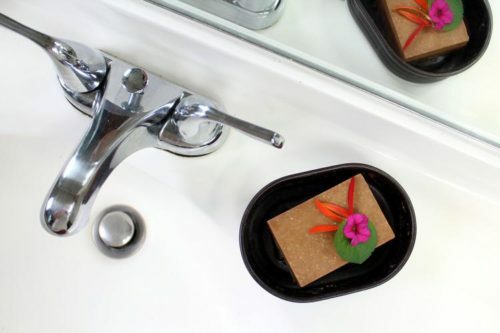 The modern design and range of colors ensures that your new soap dish not only functions as intended, but it also looks great wherever you decide to use it. The colors are also easy to incorporate into your seasonal or holiday decor. 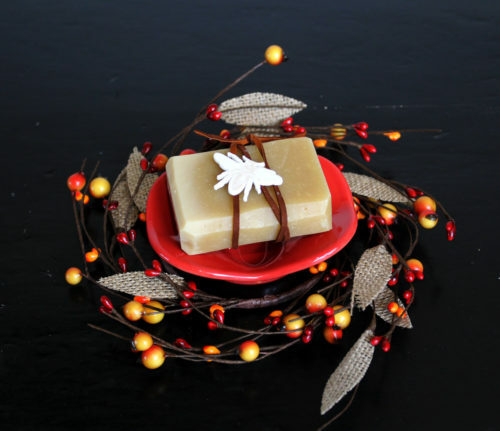 For seasonal gift giving, simply pair a Soap Bar Lounge soap dish with a bar of homemade soap. 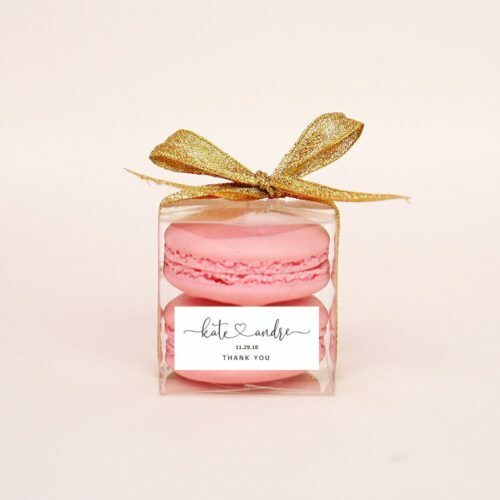 This creates a simple, yet beautiful gift idea that’s perfect for housewarming gifts, hostess gifts and holiday gifts. And, to save you money, the soap dishes from Soap Bar Lounge ship free anywhere within the United States. 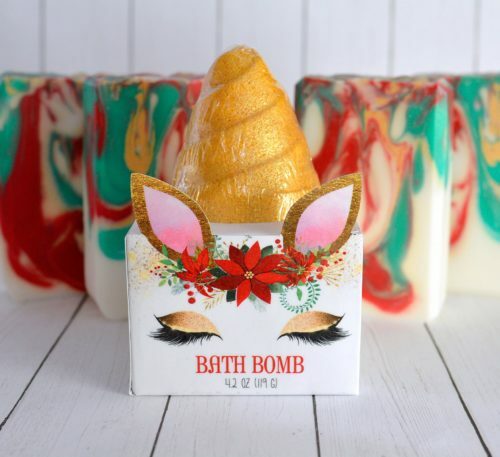 You can also purchase Soap Bar Lounge products wholesale to create instant gift options this holiday season for your small business or online shop. My Brazilian triple butter soap recipe yields six bars of homemade soap. This means you’ll have extras to give as seasonal or holiday gifts. I paired my Brazilian triple butter soaps with soap dishes in carousel red and roca beige, then accented them with leather cord and journaling embellishments for a pretty, gift worthy presentation. 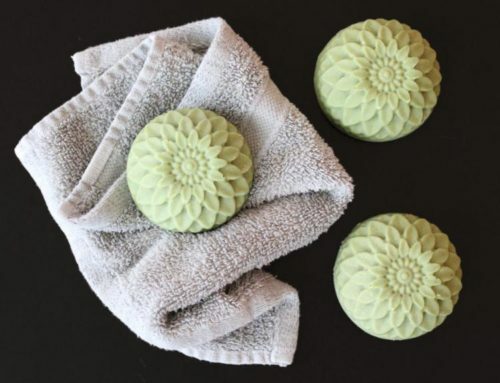 You’ll need to follow the basic cold process soapmaking method to craft these ultra conditioning, Brazilian triple butter soaps. 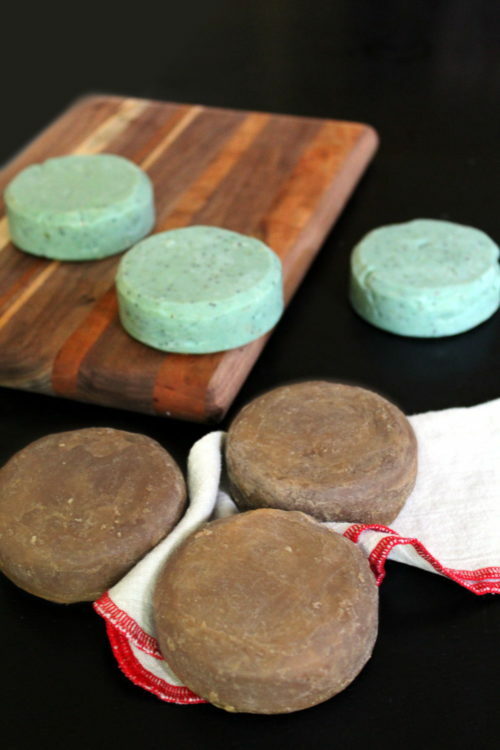 You can find a refresher course on making homemade soap from scratch here. This means ZERO aluminum and heat safe containers and utensils. 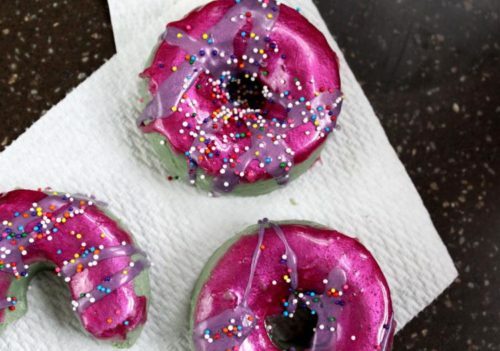 You’ll also need an immersion blender and a digital scale to weigh out ingredients. Additionally, you should also take safety measures to protect your eyes and skin when working with lye. To make my Brazilian triple butter soap recipe, begin by measuring out 4.8 fluid oz. of distilled water into a heat safe container or pitcher. Then, use a digital scale to weigh out the lye, called for in the recipe, into a separate container. In a well, ventilated area, slowly pour the lye (granules or flakes) into the water. Then mix until all of the lye has dissolved and set aside. Heat the soapmaking butters and oils called for in my Brazilian triple butter soap recipe until they have melted. You can do this by heating the ingredients in a non-metal container at 30% power in the microwave or on the stovetop over low heat in a stainless steel container. Once the butters and oils have melted, set them aside to cool. When your soapmaking fats and lye-water have cooled to around 95°-100°F, you can start making the actual soap. To do this, slowly pour the lye-water into the liquid oils and butters. Then use an immersion blender to combine the ingredients until you reach a light trace. At this point, you can weigh out and add your choice of fragrance oil, if desired, to the soap batter. As my boyfriend really wanted a more masculine scented soap, I scented my triple butter soap recipe with a sandalwood fragrance oil. Alternately, you can also use essential oils for a natural fragrance at a usage rate of up to .8 oz. by weight. 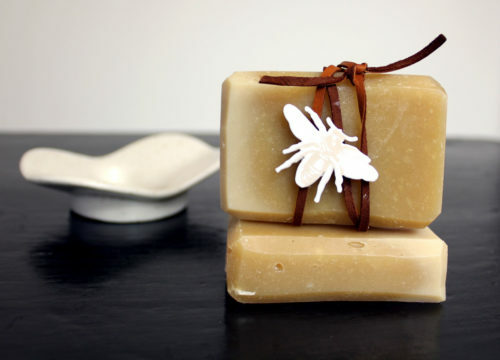 Now wrap your homemade triple butter soaps as desired for personal use or gifting. You can wrap your soaps in fabric, burlap or paper to make them easy to gift. Then simply tie on cording or a ribbon. 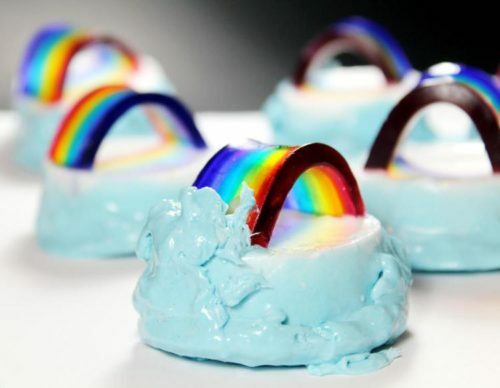 Finally, pair one or two bars of soap with a ceramic soap dish from Soap Bar Lounge as a finishing touch! Buy your favorite colors now! And don’t forget to come back and let me know how much you love your new soap dishes! 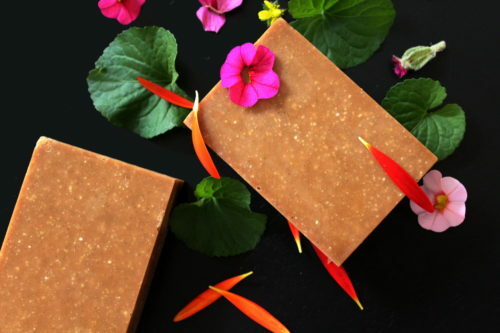 This natural bacuri butter & murumuru soap recipe is the perfect soapmaking project for exploring new ways to use exotic ingredients in natural skin care recipes. Left unscented to allow the warm, natural earthy scent of bacuri butter to shine through, this handmade soap recipe is another must for your recipe file! I am a soap addict. It’s true. Ever since I tried my first Zum soap bar back in college I’ve been hooked on handmade cold process soaps. In fact, that’s kind of the reason I started making my own. Later down the road, when Etsy first arrived as a marketplace for handmade and vintage items way back in 1995, it was like a whole new world had opened up to me. Not only was I able to purchase handmade soaps from emerging artisans, it also led to me to eventually sell my own handmade soaps. I no longer sell any of the handmade soaps or skin care products I create. Mostly because I love crafting, formulating, writing, wizardry and magic SO much more than retail sales. That doesn’t stop me from making my own handmade soaps though. It’s just that these days I never have to make the same soap twice. And all of my soapmaking formulations are completely different from the one prior. Of course, I still shop on Etsy to this day. (Wait? That’s how many years later?) And, as is the way of a self confessed soap addict’s life, I still buy other people’s handmade soap. Anyhow, I’m pretty excited about sharing my latest handmade soap recipe with you. My handmade bacuri butter & murumuru soap recipe is made using one of my newest favorite ingredients, bacuri butter. (As the name implies.) However, it also contains a new butter that I’ve recently started experimenting with called murumuru butter. Like bacuri butter, murumuru butter is a sustainable product from the Brazilian Amazon Forest. It is cold pressed from the reddish-orange fruits of the Astrocaryum murumuru tree, a tall palm tree native to Brazil. Murumuru butter has a similar melting point when compared to cocoa butter. 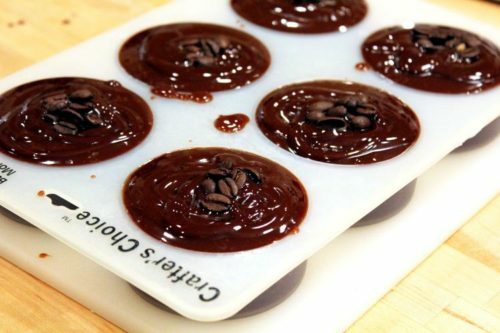 It melts at 91.4°F, while cocoa butter melts at a slightly higher temperature between 93°F and 101°F. So an easy way to start experimenting with this natural butter, would be by replacing it for the cocoa butter in your existing recipes. In addition, murumuru can also be used in the place of some of the cocoa butter in chocolate recipes to give it a firmer consistency. Most similar in composition to coconut oil, murumuru butter contains the same amount of lauric acid. However, unlike coconut oil, murumuru butter won’t clog your pores. A highly nourishing emollient and moisturizer, murumuru butter is also rich in vitamins A and C as well as Omega 3 & 6. Additionally, it also contains high percentages of lauric, myristic and oleic acid. These physical properties make murumuru butter particularly suited for skin care recipes that promote skin health or are used to remedy dry skin. Due to murumuru butter’s unique composition of essential fatty acids and Pro-Vitamin A, it makes a lovely natural option for your anti-aging skin care recipes and products. These components have been shown to help restore elasticity to damaged and aging skin as well as promote healing. As such, murumuru butter makes a wonderful addition to homemade moisturizers meant to soothe eczema, psoriasis or dry and cracked skin as well as anti-aging creams and butters. Murumuru butter is an incredibly versatile ingredient. Therefore it’s no surprise that it’s found in such a wide range of skin care and beauty products. The most common applications for murumuru butter are as part of the formulations for lotions, soaps, hair conditioners, facial masks, shampoo, oils and emulsions, skin moisturizers, depilatory waxes, lipsticks and deodorants. Also, like bacuri butter, murumuru butter can be an effective remedy against acne due to its antiseptic, anti-allergenic, antibacterial, antiviral and anti-inflammatory skin care properties. My bacuri butter & murumuru soap recipe creates a hard, long lasting soap bar with a stable lather. It’s formulated to cleanse and balance skin without overdrying, as is the case with many commercial soaps, as well as lend some skin conditioning properties. Left unscented, this natural handmade soap recipe reflects the natural, warm and earthy fragrance of bacuri butter with a milder aroma. You will need a digital scale and a silicone soap mold for my bacuri butter & murumuru soap recipe. As I make a lot of soap, I use this heavy duty Baker’s Math scale. 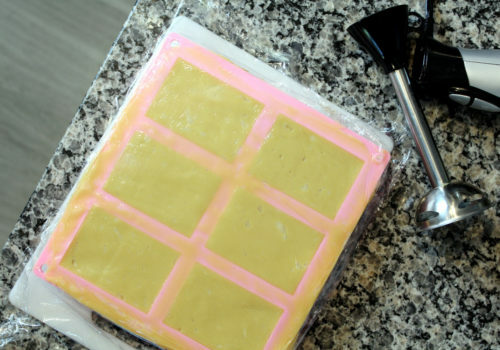 I also used this rectangle silicone soap mold for this particular handmade soap recipe. In addition you’ll also need all other required supplies for making cold process soap from scratch. These materials include a digital thermometer and an immersion blender as well as aluminum free, heat safe containers and utensils. If you have never made cold process soap before, you should read my cold process soapmaking tutorial before you begin. I also recommend starting with a simpler, beginner’s soap recipe with less expensive ingredients for your first try as soapmaking mistakes do happen. Begin by preparing the lye solution for my natural bacuri butter & murumuru soap recipe. To do this, measure out the distilled water into a heat safe container. In a separate container, weigh out the lye called for in the recipe. Now pour the lye into the water – I recommend a well ventilated area – and mix until the lye has completely dissolved. Set the lye-water solution aside in a safe location to cool. While the lye solution cools, weigh out the carrier oils, bacuri and murumuru butters called for in my bacuri butter & murumuru soap recipe. Combine your soapmaking fats in a stainless steel pot. Then gently heat the soapmaking oils on the stove over low heat just until the solids have melted. Remove the soapmaking oils from heat and allow to cool. Once the oils and the lye-water have reached 90°-95°F you are ready to make soap. Check the temperature of both the soapmaking oils and the lye solution before you begin. Both of these ingredients should be within ten degrees of one another. Using a measuring spoon, measure out one Tablespoon spoon each of both the Rhassoul clay and the salt. (You do NOT want to use Dead Sea salt.) 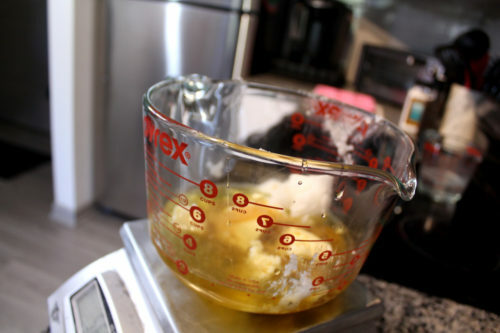 Mix into the melted soapmaking oils and butters using an immersion blender. Once the clay and salt are fully incorporated throughout the soapmaking fats, you can add the lye-water. Carefully pour the lye-water solution into the soapmaking oils and mix with the immersion blender until you reach trace. You’ll know you’ve reached trace when you drag the blender through the soap batter and it leaves a visible trail behind. It’s a little like pudding. 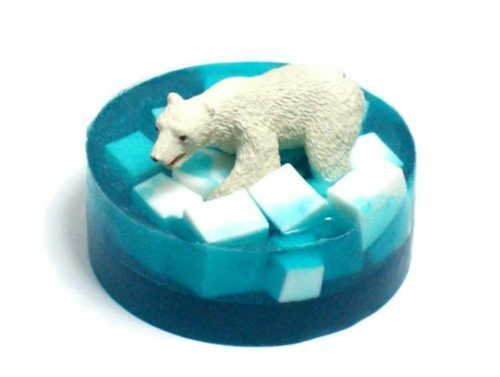 Now pour the soap evenly into the cavities of your silicone soap mold. Gently cover the soap with plastic wrap or parchment paper and set aside in a safe location where it won’t be disturbed. 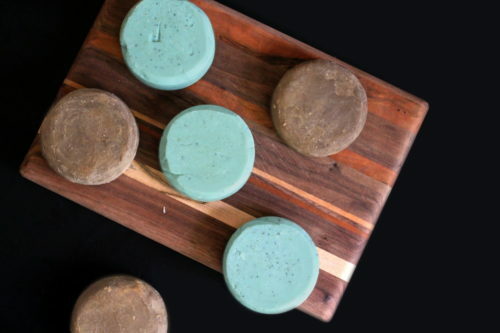 You should be able to unmold your natural bacuri butter & murumuru soaps the next day. 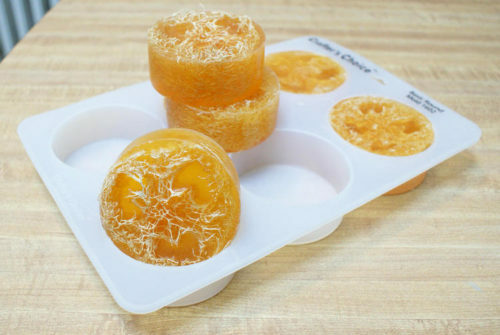 Simply turn them out of the mold cavities, then allow your soap to cure for four to six weeks in a cool, dry location. After that, your handmade soaps are ready to use. 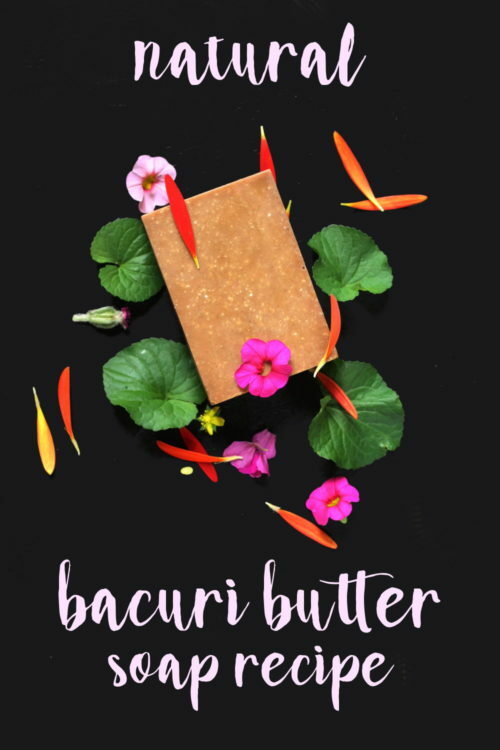 If you like my natural bacuri butter & murumuru soap recipe, then be sure to try my other bacuri butter skin care recipes. These recipes include my 3-ingredient bacuri butter body butter recipe and my anti-aging bacuri butter body balm recipe. Alternately, you can find a complete listing of all of my cold process soap recipes from over the years here. For more great projects like my bacuri butter & murumuru soap recipe, be sure to follow Soap Deli News on Pinterest, G+, Facebook, Twitter and Instagram. Alternately, you can subscribe to Soap Deli News via email for future updates, DIY projects and recipes. 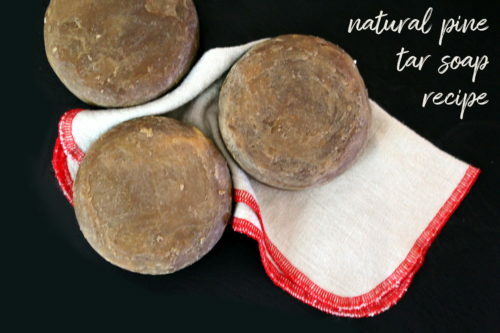 This all natural pine tar soap recipe tackles tough skin conditions caused by bacteria, fungus and yes – parasites! Keep reading to learn how to prevent bites from parasitic chiggers as well as how to craft your own all natural pine tar soap recipe with neem oil to soothe insect bites, calm itching and promote healing. When I was eight I went on my very first (and only) snipe hunt with my Brownie troop. It was just one part of an adventure filled summer in which I also learned how shoot a bow and arrow. Our group leader had, of course, planned out the snipe hunting trip in advance. Having grown up with family who went on yearly hunting trips for venison (in addition to the occasional squirrel or rabbit) a snipe hunt seemed like a completely plausible scenario to teach us a new life skill. As our snipe hunt took place prior to the existence of the internet, we had no way of knowing one way or the other what a snipe hunt was other than what we were told. Naturally everyone in my Brownie troop was excited about the idea of catching our very first rabbit-sized snipe. The day of the snipe hunt we were given a rather vague description of what snipes looked like. One girl was given a large fishing net. Another Brownie was given a bag. The rest of us found sticks that we could use to scare a timid snipe out of the brush. So off we went, huddled in a group half skipping with excitement, down a forest trail with sticks in hand. Our group leader would occasionally travel ahead only to rush back claiming from time to time that she’d just seen a snipe – what was a wonderful yet entirely imaginary creature. This fueled our excitement and kept us going despite never actually seeing said snipe for ourselves. I don’t really recall how long we spent hunting this poor (completely fabricated) creature through the woods. However, I do remember the disappointment in learning that we’d been duped. A tradition that dates as far back as the 1840’s in America, snipe hunting is a practical joke in which an unsuspecting newbie is duped into trying to catch a non-existent animal called a snipe. Many of us who grew up prior to social media (Hello all you lovely baby boomers and Gen-exers!) have at one time been a victim of this prank. So it was no wonder that when my Northern bred boss first moved to Virginia, he thought he was also a victim in a somewhat similar scenario. Before I dove into self-employment full time I worked for a small family owned business. The owner and his family were originally from New Jersey. As new transplants to Southwestern Virginia, there are quite a few “cultural” differences between the North and South. My boss at the time, Bill, quickly discovered many of these differences through working with clients. However, one instance in particular was somewhat similar to my own snipe hunting excursion many years back. But this time, in reverse. While out scouting a potential job site, Bill found himself knee high in a field of tall grasses and wildflowers. Bill’s client immediately warned him of the possibility of chiggers in the weeds. Assuming that chiggers were an imaginary creature – something like that long ago snipe we’d both been tricked into hunting – Bill dismissed the warning. He was absolutely convinced that his client, who was born and raised in the South, was pulling his leg. Unfortunately, he was not. Chiggers are quite real. It’s also quite possible that they are spawned from Satan. Not visible to the naked eye, these tiny white mites are parasites in their larval stage and live on or UNDER the skin of warm blooded animals. Commonly found in forests and grasslands, chiggers, or trombiculidae mites as they are referred to by scientists, are a relative of ticks. In addition to red, pimple like bumps and hives chiggers leave behind, they also cause the most horrendous itching EVER. It is not a pleasant experience. So in fact, in Bill’s case, a Northerner had not been duped by a Southerner. Rather Bill’s client had given him fair warning and Bill paid the price for his disbelief. Chigger bites are most common in late spring, summer and early fall when the temperatures are between 77°F and 86°F. As the parasitic larvae don’t fly, they tend to stick together in large clumps on low lying grass and leaves. As a person or animal walks by, chiggers then attach themselves to their next warm blooded meal. Chiggers then use their claws to make tiny holes in skin. Then they inject their saliva into the hole they create in order to liquify and feed off of skin cells. The resulting itching and dermatitis from chiggers lasts for several days. And it’s extreme enough that it can keep you from sleeping. Healing then occurs within one to two weeks. There has been some success in repelling chiggers using essential oils. Just as citronella repels mosquitoes and lemon eucalyptus essential oil repels deer ticks, studies suggest essential oils can also be used to repel chiggers. The top essential oils for a chigger repellent spray include citronella, tea tree, geranium and lemongrass essential oils blended in jojoba oil. I recommend using three drops of each of these essentials oils per ounce of jojoba oil if you’d like to craft your own chigger repellent. Simply combine each of these ingredients together combined in a large roller ball bottle. 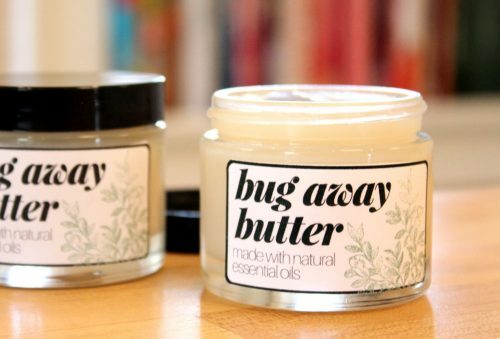 Alternately, you may also want to try to my natural insect repellent body butter recipe which also contains anti-parasitic neem oil. Should you one day, like Bill, find yourself knee deep in not so imaginary creatures there is a simple and natural solution. My favorite natural remedy for chiggers is pine tar soap with neem oil. If you own horses you’re likely already familiar with pine tar. A natural, antiseptic germicidal product for horse hooves, pine tar is an effective treatment for quarter cracks, split hooves, corns and hard frogs. It’s also used on animals to treat scrapes, burns, abrasions, sores, cuts and thrush. When used in soapmaking, pine tar works to treat a variety of problematic skin conditions. 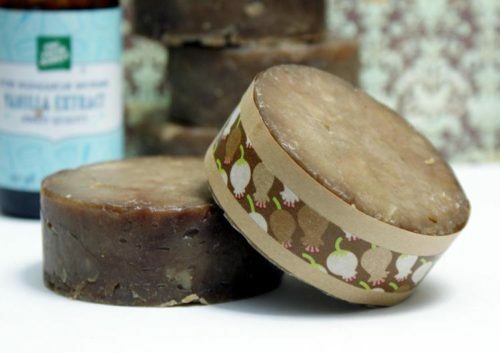 Pine tar soap is shown to be effective at fighting psoriasis, eczema and dandruff as well as skin inflammation. Additionally, all natural pine tar soap can also be used to soothe and treat the symptoms of poison ivy, oak, and sumac. It also relieves the itching caused by bug bites – and chiggers. Discover more natural neem oil skin care recipes here. As I wanted to formulate an all natural pine tar soap specifically for skin issues that dealt with parasites, I also used neem oil in my recipe. Neem oil, which research shows has natural anti-inflammatory and analgesic (pain killing) properties, has also been used as an anti-parasitic treatment for thousands of years in India. As a natural skin care remedy, it is used topically to reduce the symptoms of common skin conditions such as eczema, ringworm, athlete’s foot, cold sores, psoriasis, warts, scabies, candida, infected burn wounds, slow-healing skin ulcers and even acne. Combined, pine tar and neem oil create a powerful natural remedy that’s a must for any home apothecary. Not only does my all natural pine tar soap recipe soothe itching and promote healing caused by general skin care concerns, it’s also effective at fighting those not so imaginary creatures that we can’t see, but still exist. 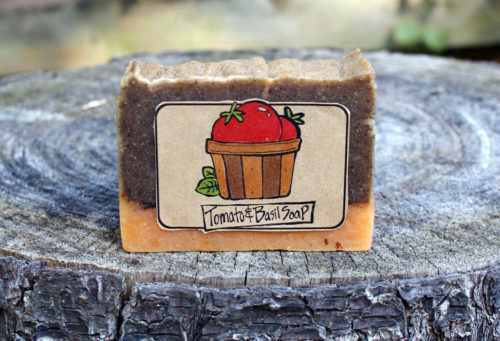 This handmade artisan soap is a must for anyone who enjoys spending time outdoors in the summer! The water percentage for my all natural pine tar soap recipe was calculated at 35% of the oil weight for 5.6 oz. I then reduced that amount by the amount of pine tar called for in my all natural pine tar soap recipe. For a harder bar of soap, you can add one Tablespoon of (60% solution) sodium lactate to your lye/water once it has cooled. My all natural pine tar soap recipe is a cold process soap recipe – meaning it is made from scratch using lye. To duplicate my pine tar soap, you’ll need to follow my basic cold process soapmaking instructions. You should also take proper safety precautions when working with lye. Gloves and eye protection are recommended. You will start by mixing the lye/water. To do this, measure out the distilled water called for in the recipe into a non-aluminum, heat proof container. Then, using a digital scale, weigh out the lye. Slowly pour the lye into the water in a well ventilated area. Now stir the lye and water together until the lye dissolves completely. Once the lye has dissolved, set the lye/water mixture aside to cool. Next, weigh out the sweet almond, castor, coconut, olive and neem oils. Combine in a non-aluminum pot. Follow with the mango butter, sal butter and pine tar, first weighing out each ingredient, then combining in the pot with the liquid carrier oils. Heat the soapmaking fats (your carrier oils, butters and pine tar) over low to medium-low heat on the stove until all of the ingredients have completely melted. Then set aside to cool. While the lye/water and soapmaking oils cool, weigh out the essential oils into a separate glass container. To avoid having your all natural pine tar soap seize from the additional heat generated during the saponification process from the pine tar, allow both the lye/water and the soapmaking oils to cool to around 80°F. Once the temperatures of the lye/water and soapmaking oils have come down and are within 10°F of one another, you are ready to make my all natural pine tar soap. Add the essentials oils to the pot of soapmaking oils. Then mix with a stick blender to combine. Set the soap aside. After 24-48 hours, unmold your all natural pine tar soap. 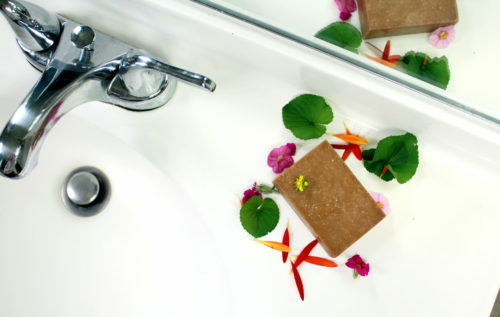 Then allow your soap bars to cure in a cool, dry location for four to six weeks. If you aren’t read to make my all natural pine tar soap recipe, you can buy handmade artisan pine tar soap online. 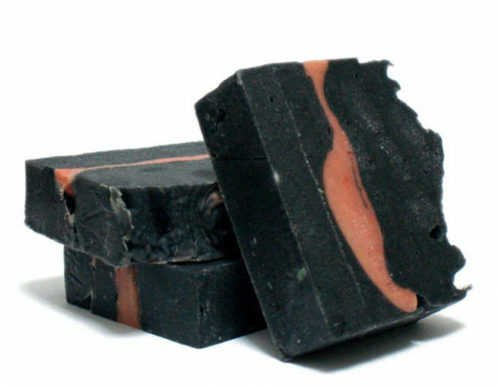 I’m partial to this pine tar cleansing bar soap from AJ’s Elixirs. Alternately, you may also like this natural bug repellent spray from Arrow Essentials. 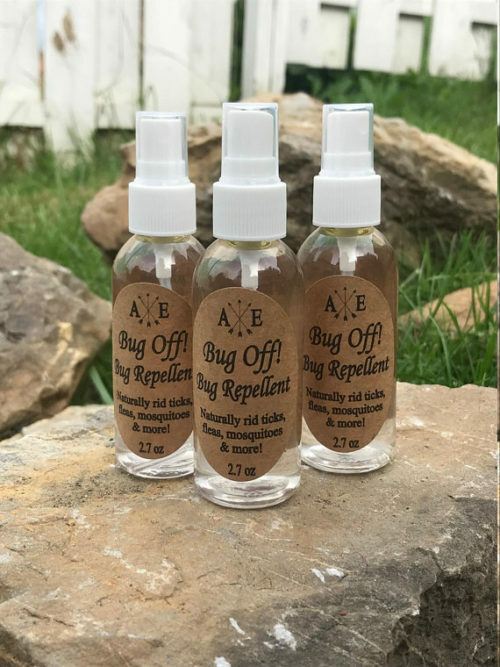 Crafted using a combination of lemongrass, French lavender, peppermint & eucalyptus essential oils, this all-natural bug repellent repels ticks, fleas, mosquitoes, lice, beetles, flies, chiggers, ants and spiders. Completely chemical and DEET free, this product has a crisp, refreshing aroma that you won’t mind putting on! 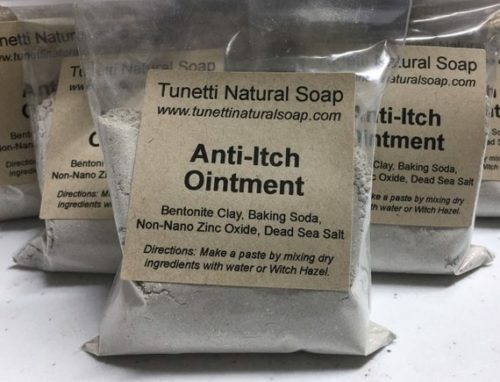 Or to soothe and calm itching from insect bites you already have, try this natural anti-itch ointment from Tunetti Natural Soap. Formulated with bentonite clay, baking soda, non-nano zinc oxide and Dead sea salt, this effectively stops itching caused by chigger and mosquito bites as well as poison ivy, poison oak and poison sumac. Simply mix the dry ingredients with water or witch hazel for a simple, natural home remedy. For more natural home remedies that you can buy, check out my collection of natural home remedies on Etsy. You can also discover more natural home remedies that you can make yourself via my Natural Home Remedies & Herbal Health Care Pinterest board. Be sure to follow Soap Deli News blog to discover more natural beauty and skin care recipes. You can find me on G+, Pinterest, Facebook, Twitter, Blog Lovin’, and Instagram. Or simply subscribe to Soap Deli News via email for future updates, DIY projects and recipes.